I thought I’d start this post with some classic Dire Straits, largely for the extreme tech culture shock value, but also because “MTV” has the same number of syllables as “NBN”. I’ll wait while you watch it. Getting online is easy. Whatever you plug into the NTD just gets an IP address via DHCP – there’s none of that screwing around with PPPoE usernames and passwords. 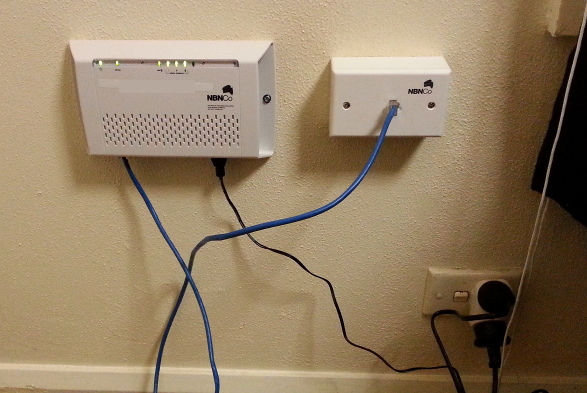 The BoB Lite lets you configure one of its ethernet ports as a “WAN source” instead of using ADSL, which is what I’m doing. Alternately you could plug in a random Linux box and use that as a router, or even just plug your laptop straight in, which is what I did later when trying to diagnose a fault. Speaking as someone who works from home and who has to regularly download and upload potentially large amounts of data, this is a huge benefit. Subjectively, random web browsing doesn’t seem wildly different than before, but suddenly being able to download openSUSE ISOs, update test VMs, and pull build dependencies at ~2 megabytes per second has markedly decreased the amount of time I spend sitting around waiting. And let’s not leave uploads out of the picture here – I push code up to github, I publish my blog, I upload tarballs, I contribute to wikis. I’ve seen too much discussion of FTTP vs. FTTN focus on download speed only, which seems to assume that we’re all passive consumers of MTV videos. OK, fine, I’m on wireless and FTTP is never going to be an option where I live, but I don’t want anyone to lose sight of the fact that being able to produce and upload content is a vital part of participating in our shiny new digital future. A reliable connection with decent download and upload speed is vital. Now that I’ve covered the happy part of my NBN experience, I’ll also share the kinks and glitches for completeness. I rang up to get connected on August 1st. 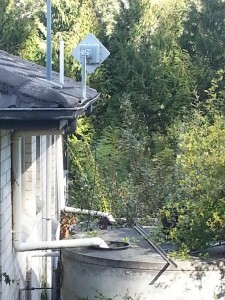 At the time, the next available installation appointment was August 21st. On that day I got a call saying the technician wouldn’t be able to make it because his laptop was broken. I offered to let them use my laptop instead, but apparently this isn’t possible, so the installation was rescheduled for September 6th. All attempts at escalating this (i.e. getting the subsequent 2.5 week delay reduced, because after all it was their fault they had a broken laptop) failed. 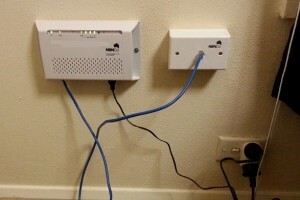 By the time the right person at iiNet was able to rattle enough sabres in the direction of NBN Co, the new installation date was close enough that it didn’t make a difference anymore. To be clear, as far as I can tell, iiNet is not at fault; the problem seems to be one of bureaucracy combined with probable understaffing/overdemand of NBN Co (apparently this newfangled interwebs thingy is popular). As an aside, I mentioned the “broken laptop” problem to a friend, who said a friend of his had also had installation rescheduled with the same excuse. I’m not quite sure what to make of that, but I will state for the record that I seriously doubt our new fearless leaders would have been able to make matters any better had they been in power at the time. ODU stands for Outdoor Unit, which is apparently the antenna. 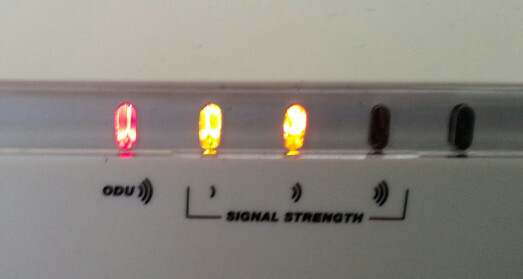 For at least an hour, the lights cycled between red and green ODU, and two orange / three green signal strength. 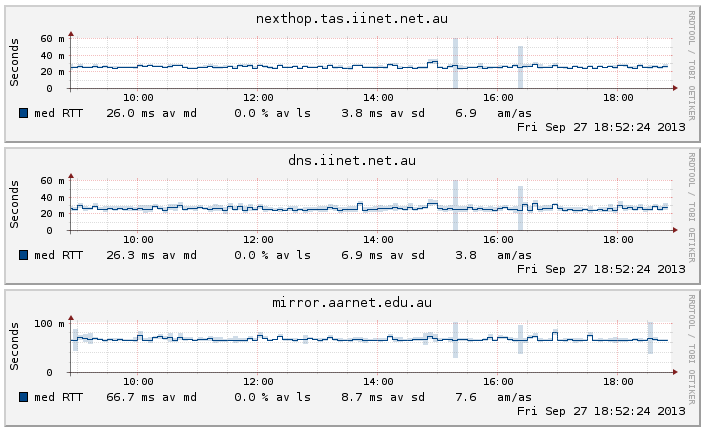 Half an hour on the phone to iiNet support, as well as plugging a laptop directly into the NTD didn’t get me anywhere. I managed to get a DHCP lease on my laptop very briefly at one point, but otherwise the connection was completely hosed. 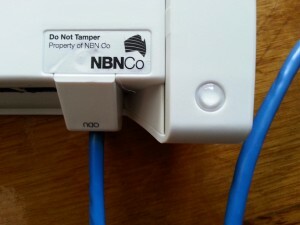 The exceptionally courteous and helpful woman in iiNet’s Fibre team logged a fault with NBN Co, and I switched my ADSL – which I had kept for just such an emergency – back on, so that I could get some work done. Any chance of sharing how you set up smokeping? I’m assuming you did it on openSUSE, and last time I did it (for very similar purposes) was a long time ago on an old Fedora release, where I remember it being kind of ugly to do. Actually, it’s on a relatively ancient PPC Mac Mini running Debian… Sorry to say I didn’t take any particular setup notes. It’s built from source, installed in /opt/smokeping. It’s pretty much the default config with a handful of hosts defined that make sense for me, as indicated in the graphs above, plus a symlink from /var/www/smokeping to /opt/smokeping/htdocs and a matching apache virtualhost definition. I am in a place of lightning and thunderstorms and so far the NTD has blown twice, I am on my third one. I am not paying for it so not worried, but what I do concern myself with is that to replace this NTD it takes 8 – 10 days. For me that means no internet, I can handle that, but no phone and that is a real problem as I have medical issues. Anyway, I won’t win all of the time, but if I can see a thunderstorm coming, what happens to the NTD if I pull the plug to the antenna? Do I leave it on (power) or turn it off? I am getting fed up with all the down time when it dies, if I can pull that plug out to save it from being fried, then I will do so. Any ideas, I would appreciate. My guess is the best course of action would be to power the NTD down, then pull the plug to the antenna. Later, plug the antenna back in, then power it back up. That is what I thought of doing. I even asked my ISP and they said No. But every 2 weeks when I do our major shopping, I have a guard dog who’s also my assistance dog indoors for up to 6 hours while we are away, so have little or anything running while he’s in the house, for his safety more than anything else. At these times I have turned off the NTD and restarted using a system I thought might be a safe idea. Turn on NTD, wait 15 mins. Turn on Modem wait 15 mins. The phone is also connected to the Modem, and the Internet adapter/plug is out at this time. Turn on the PC and when loaded, plug the Internet cable in. I do all this in reverse when I want to turn it off. Waiting times may be a bit extreme, but better safe to allow for any updates. Sorry it took some time to come back to reply, we had part of Cyclone Debbie hit us and I was off line more often than on. Forgot to add, why in the hell isn’t there a fuse or fusible link between the antenna and the NTD, blow that instead of the NTD? I am on my third one, the people across the road are on their 3rd too. And so a business I have frequent dealings with, they are on their 3rd also. That’s 6 extra NTD’s for 3 people over a maximum of 9 months that could have been used for 6 new clients.